The award-winning Linden String Quartet (LSQ) continues the University of Wyoming Cultural Programs fall concert series at 7:30 p.m. Friday, Nov. 8, at the Buchanan Center for the Performing Arts concert hall. Tickets cost $20 for the public and $17 for UW students and seniors. For tickets and information, call (307) 766-6666 or visit the Wyoming Union or Performing Arts Center box offices. 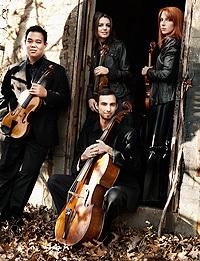 Recognized as having “considerable fire and flair” by the classical music magazine The Strad, the LSQ has trained at the Cleveland Institute of Music, and has won the Concert Artists Guild competition, the Fischoff National Chamber Music Competition, along with five other major competitions. The group has been mentored by the Tokyo, Cavani, Cleveland and St. Lawrence string quartets. “We’ve had a good track record launching young artists, and we’re pleased to do it again with the Lindens -- a string quartet of the highest artistic caliber poised for a brilliant career,” says UW Cultural Programs Director Cedric Reverand. For more information about the program, call (307) 766-5139 or email www.uwyo.edu/finearts/.